This story has a few things in common with The Highlanders, most obviously (re)introducing Jamie and featuring a conflict between Highlanders and Redcoats. Jamie himself is a more militant character than we’ve become used to, much as he was when the Doctor first met him, though there is still some fun to be had as the Highlander struggles to comprehend the advanced technology and complicated concepts he encounters. Meanwhile, the Doctor is mistaken for a Frenchman, and adopts a comedy accent to aid his plan of tackling a villain who is motivated by financial gain. Hines steps straight back into his role, despite the passage of time and the ways in which his character’s circumstances have changed. Georgia Moffett (The Doctor’s Daughter) provides spirited support as the “bonny wee lassie” Alice. I’m a little disappointed that Jamie doesn’t get his memories back in this story, as I had been expecting him to, though the fact that Wendy Padbury’s Zoe will be returning in a couple of releases’ time offers some hope of restoration. I also find it odd that the Doctor never seems to consider the possibility that the Overlord (John Banks) might not be from another time. He could be supplying petroleum to alien civilisations that have arisen earlier than those of Earth. However, I suppose the fact that the timeline has been altered informs the Doctor that temporal intervention is involved. Disc One also includes eight minutes of Andy Hardwick’s incidental music, while Disc Two ends with twelve minutes of interviews with the cast and crew. 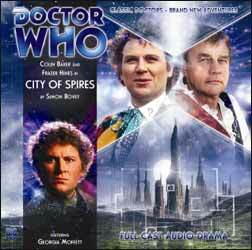 Numerous plot strands set up in City of Spires are left dangling, to be sewn up in subsequent stories in the trilogy. However, this is still in-Spire-ing stuff.